We ended the 2017-2018 fiscal year with a total membership of 192 alumni and friends which represents only a small portion of the more than 600 alumni identified as living in the area. Our goal for 2018-2019 is to enroll 200 members. 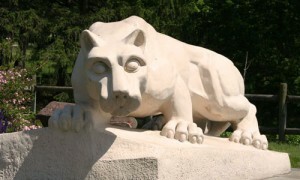 The current Board stands committed to carry on the traditions of service, scholarship and community that are the hallmark of a Penn State education. WE ARE... what we do and what we have become. Join us! The first meeting to create the Myrtle Beach chapter of Penn State Alumni was held on November 18, 2010 with the PSU Alumni Association Regional Director (Cheryl Stringer.) Harry Wynn, Phil Cox, Alicia Smith, Garrett Miller, Kelly Shulkitas, Bob Bastian, Jean Bastian and Tom Turan were in attendance and became the first board in January 2011, with Harry assuming the first presidency. This intrepid group of transplanted Lions initially thought that they would prefer the name "Grand Strand" and "Greater Myrtle Beach" but later settled on the current "Myrtle Beach Chapter" name. The founding Board members set out an ambitious agenda of activities and in their first year enrolled 20 members. By Laws for the new chapter were officially adopted January 19, 2011. Afterwards the initial Annual Picnic was held prior to the kick off of the 2011 football season August 14, 2011 at Myrtle Beach State Park; which was catered by Joey Doggs. Viewing parties were held at Handley's Pub and Grub in Myrtle Beach. The chapter has been active ever since. The following highlights identify some of the more important activities and accomplishments in the years that have followed. Board Members – Harry Wynn - President, Phil Cox, Alicia Smith, Kevin Dobis, Eileen Soisson and Bill Steuernagel. Special Dinner – Wednesday (June 27, 2012) at 5:30 PM at Pine Lakes Country Club with guest speaker Brandon Noble (former PSU player and assistant football coach at Coastal Carolina University). 2nd Annual Picnic – August 19, 2012 at Myrtle Beach State Park; catered by Proud Purveyors of Pork (Pork BBQ). Board Members – Harry Wynn – President, Kevin Dobis – Treasurer, Bill Steuernagel – Secretary, Alicia Thompson, Phil Cox and Eileen Soisson. 3rd Annual Picnic – July 7, 2013 at Myrtle Beach State Park; catered by Fuddruckers. Board Members – Phil Cox – President, Bill Steuernagel – Secretary, Sue Millin – Treasurer, Jim Prisco – President Elect, Jonathan Martin – Communications and Eileen Soisson. 4th Annual Picnic – June 15, 2014 at Myrtle Beach State Park; which was catered by Sticky Fingers. Board Members – Jim Prisco – President, Phil Cox – Past President, Vicki Acri – Treasurer, Vince Rizzo – Secretary, Jonathan Martin – Communications, Charles Glazer and Eileen Soisson. 5th Annual Picnic – June 14, 2015 at Myrtle Beach State Park; which was catered by Sticky Fingers. 6th Annual Picnic – June 16, 2016 at Myrtle Beach State Park; which was catered by Sticky Fingers. 5th Annual Dinner – scheduled: March 31, 2017 at Pine Lakes Country Club with guest speaker Blair Thomas. 6th Annual Picnic – scheduled: June 11, 201 at International Club Amenities Center. 5th Annual Dinner – scheduled: April 6, 2018 at International Club Grille with guest speaker Tina Hay. 6th Annual Picnic – scheduled: June 10, 2018 at International Club Amenities Center.